I hold broccoli in very high esteem. It has a bright, earthy flavor, it’s really quite good for you, and I like it a whole bunch. I am far from alone in this, and when one of my associates suggested a broccoli sandwich I immediately set to work. After thinking on it a while, what I eventually settled on was not to build a sandwich around straight broccoli. That’s a challenge for another day. For a first attempt at a broccoli sandwich I brought along quite a bit of support. Firstly, I put cooked broccoli florets in the food processor, chopping them well but not to mince. I mixed the chopped broccoli up with a quinoa/brown rice mix, some breadcrumbs, and an egg. This mix I fashioned into patties, which were then put into a hot skillet until both sides were crispy and brown. I built two sandwiches around the patties, both with a few slices of salami and caramelized onions. One sandwich got a few slices of cheddar cheese, and the other a fried egg. It will come as a surprise to no one that the sandwich with a fried egg was much better, but there are plenty of times when one wants a sandwich without going to the trouble of frying an egg, and I wanted to get a sense of the sandwich in that context. Regardless of the egg’s superiority, these were both very tasty sandwiches. The broccoli patty was crunchy, the grains rounding out the flavor to something a bit deeper, more nuanced. The salami was a bit lost in the rest of the things, but between the patty, the sweet onions, and the richness of the egg I didn’t miss it. In the other sandwich the salami was a bit more noticeable, and the cheese was present but didn’t overwhelm the broccoli. For a first attempt at a broccoli sandwich, I would say this was a rousing success. 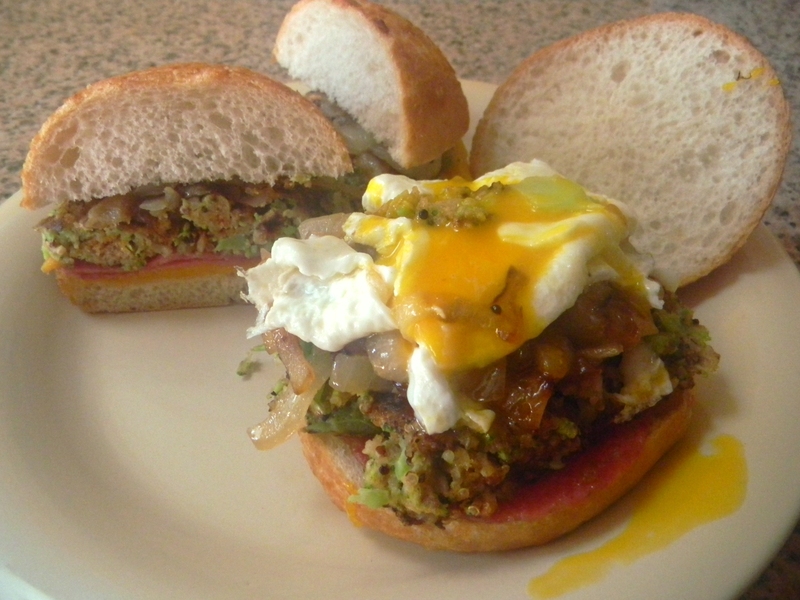 There are other, more daring broccoli sandwiches to be made, but it was hard not to be satisfied with this attempt. There’s a place in Tallahassee that does a fried egg, sausage patty, provolone, and a bunch of steamed broccoli on a ciabatta. The whole affair comes together shockingly well. They call it “Eggs, Cheese & Trees” but I’m of a similar mindset in thinking the cheese brings very little to the table. I’ll definitely be taking a stab at your broccoli patties. It is not my intention to be rude, and it may be that I am wrong, but given that you do seem to genuinely care about being correct about origins and the etymology of things like the names of sandwiches, i thought to mention this: I am under the distinct impression that those are correctly referred to as, “Carmelized onions.” Named, I believe after the famous City in California. “Caramelized,” seems technically right, but then again so does cutting up the romaine lettuce and still calling it a Caesar salad. I leave it up to you to ascertain the veracity of this premise. We can discuss the American penchant for white bread and putting cheese (or cheese-like material) on absolutely everything (WhatTheHellIsThatAllAbout?!) later. Oh, and adverbs too. Worry not over rudeness, I appreciate any and all concerns. Googling around a bit doesn’t yield much on Carmel as the source of deeply browned onions, but I have associates whom I believe have some ties to Carmel, so I assure you I will investigate further. I hope you do not take my inclusion of cheese here for an endorsement of compulsory cheese. I have addressed this issue to some degree in other reviews (http://bit.ly/Kidh1B) and if you take a spin through the Sandwiches I Have Made tag, you’ll find a great number of them have no cheese whatsoever.